Amusement parks are popular destinations throughout the world as places for people to spend their leisure time, generating revenue into the tens of billions of U.S. dollars each year for the operating companies. The Walt Disney Company is the leading company in the industry with more than 16 billion U.S. dollars in revenue from its theme & amusement parks. Universal Studios Theme Parks, the theme park division of NBC Universal (a subsidiary of Comcast), is the second largest company from the United States, with around 3.3 billion U.S. dollars in annual revenue. The theme & amusement parks of Walt Disney Attractions are also the most visited in the world, drawing approximately 138 million visitors in 2015. Parks of the Merlin Entertainments Group drew the second-most visits with around 63 million in 2015. The most visited theme park in the world was the Magic Kingdom Park at the Walt Disney World Resort in Florida with around 20.5 million visitors in 2015. 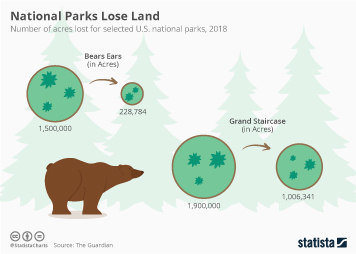 National Parks that are under the administration of the National Park Service draw around 300 million visits each year. For 2017, a total number of almost 311 million visits is estimated. In the month of July, visitorship is at its highest with more than 1.3 million visits per day to National Parks, Monuments and Sites. The Grand Canyon National Park for example drew 5.52 million total visits in 2015. Direct economic impact of National Park visitor spending on local economies is estimated at around eight billion U.S. dollars per year. Public parks are mostly maintained by city park agencies in the U.S. The city of New York for example spent about 1.43 billion U.S. dollars on its parks in 2016. This includes both operating and capital expenditures. The city of Irvine spent the most on its parks in 2016, on a per-resident basis, with 215 U.S. dollars per resident. The most visited city park in the U.S. is the Central Park in New York with around 42 million visitors in 2016. Amusement Parks in the U.S.
3. National parks in the U.S.
4. Public (city) parks in the U.S.
More interesting topics from the industry "Parks & Outdoors"